The fence surrounding J Raymond Mireles’ house in Logan Heights isn’t there just to keep people out. In fact, the photographer is using his fence – a symbol of privacy and security – as an experimental public art project meant to bring people together. 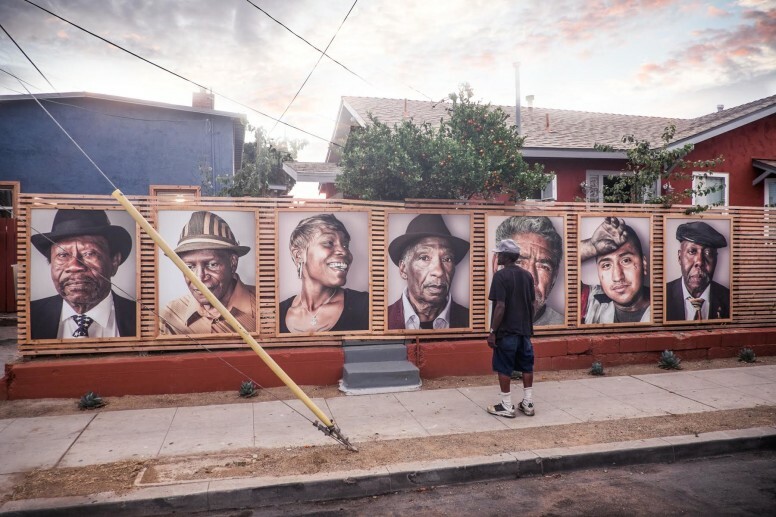 Mireles recently mounted seven large-scale photographs he took on a new wooden fence that wraps around his home on Imperial Avenue. The nearly four-by-five-foot portraits feature the faces of people who live and work in his neighborhood. Next to the stretches of barren chain-link, corrugated steel and concrete fences common in the neighborhood, Mireles’ art installation is striking. The sidewalk’s been morphed into a makeshift outdoor art gallery – people often linger in front of the oversized faces trying to figure out why they’re there. Inside his home, Mireles thumbed through a stack of the rest of the large-scale prints he’s preparing to frame and mount on the fence. Mireles flipped through a few more photos, then stopped at the portrait of a smartly dressed older man in a fedora. Mireles is white. Most of his neighbors in Logan Heights are black or Latino. So far, his fence features a patchwork of black and brown faces (he’s yet to meet a white neighbor who’s agreed to a photo shoot). Before he moved to the neighborhood a few years ago, the longtime local said he rarely saw or interacted with non-white people. He said he thinks the majority of white San Diegans don’t interact much with people of other ethnicities either. He wants that to change and he thinks his public art project can help – or at least get people talking about race relations in San Diego. Mireles will soon fill the rest of his fence with photos of his neighbors. Then, at 4 p.m. Saturday, Oct. 10, he’ll hold an opening reception at his house (2747 Imperial Ave.) with food, drinks and live music. He’s inviting his neighbors and working to get people from outside the neighborhood to come, too. Kevin Bernardino works at an auto shop a block away from Mireles’ home. He’s one of the subjects in the photos – the young and tattooed guy with a grease-covered hand held up to his forehead. The other images try to tell similar stories. Mireles wanted to cast a positive light on his neighbors. A few days after he hung the first photos, he said a man in a wheelchair came up to him loaded with questions and one criticism. He said the man wanted him to add a few white faces to the fence. Mireles said he thinks of his fence project as the first phase of a much larger DIY public art project. He’d like to eventually gain access to other property owners’ walls and fences in Logan Heights and mount more large-scale photos of people in the neighborhood. Kinsee Morlan was formerly the Engagement Editor at Voice of San Diego and author of the Culture Report. She also managed VOSD’s podcasts and covered the arts, culture, land use and entrepreneurs.